I said I was going to opt out of Craving Ellie in my Belly this week, since we don't eat some of the key ingredients in Jambalaya with Shrimp and Ham (hosted by Anonymous New York). Well...just kidding! I changed my mind and decided to try to be flexible, adapting the recipe to what we do eat, instead of taking the easy way out and eating out for the 17,000th time this week. I substituted ground turkey for the shrimp and ham, and used an orange bell pepper instead of the green (my substitutions are noted in the recipe below). I'm really glad I decided to go for it, because jambalaya is delicious! Not only is it fun to say (jambalaya jambalaya jambalaya), it's relatively easy to make (despite the many, many ingredients) and, like all of Ellie Krieger's recipes, is health-happy. If you like ground turkey, I highly recommend using it in this dish. It was the perfect texture and complement to the strong tomato-y flavor. Although it's June, I can picture this as a cozy winter comfort food. Anyone down there in the Southern hemisphere? 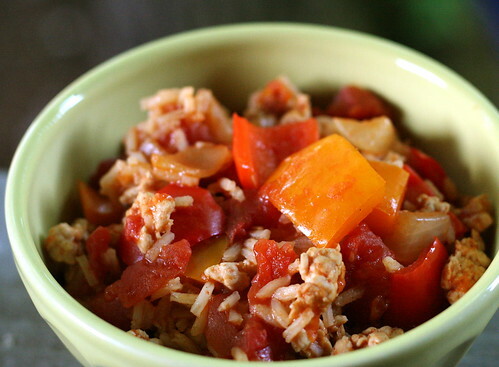 Click here to see how everyone else's jambalaya turned out! 1. Brown the turkey in a frying pan. Set aside. 2. Heat the oil in a large dutch oven over medium heat. Add the onion, bell peppers, and garlic and cook, stirring occasionally, about 10 minutes. Add in everything else (including turkey) but the rice and hot pepper sauce, and bring to a boil. Stir in the rice, cover, reduce heat to low, and simmer until the rice is done and most of the liquid is absorbed, about 20 minutes. 3. Season with salt and pepper. Serve with hot pepper sauce on the side. I never even thought about ground turkey - what a great sub! I'll have to try that. I totally agree about a chilly weather item - it'll be an awesome comfort food meal that won't blow a diet! Glad you decided to cook along with us this week after all :-). I saw a lot of interesting subs all around from the group on this one. We used chicken sausages in ours so its not a stretch at all to see ground turkey working here. We finished up the last of the leftovers from this @ 10pm last night, lol. Good for you for trying the recipe even if you left out the shrimp. I very often leave the key ingred. out because I enjoy meatless versions just as well. It looks good - glad you did it. Delicious isn't it? I love making this on weekends! And don't you just feel like singing "Jambalaya" when saying it :)I'd love to guide our readers to your site if you won't mind.Just add this foodista widget to this post and it's all set to go, Thanks! Mmm looks wonderful. I have always wanted to try Jambalaya and now I know where to look for a lovely recipe!! I've never had jambalaya since I don't eat meat... would this be worth making sans shrimp/ham/turkey sub? Or would soy crumbles (the fake ground beef variety) work instead? Since I have no idea what it tastes like, I'm not sure what can and can't be substituted or how essential the meat is to the final product! I'm glad you decided to make the recipe after all! Ground turkey sounds like a delicious substitute and I'm so glad you enjoyed it! You have lovely pictures on your blog. Congrats on your recent anniversary and for the beautiful wedding cake recreation. It looks scrumptious!! Hey, I made this tonight. It was great! I would use a grain meat, soy is horrible for you. Use a grain sausage, waaaay more flavor. FIELD ROAST makes WONDERFUL substitution meats, all GMO free and SOY free.